Recycling Receptacles manufacturer Glaro Inc. provides the following tips to receptacle dealers, building managers, designers, architects and consumers seeking to research and purchase the right recycling receptacles for public and private facilities. 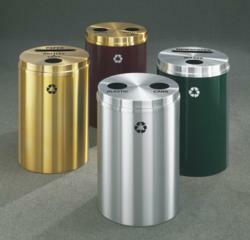 Aluminum recycling receptacles are scratch resistant, they do not corrode and they cannot tarnish. A galvanized steel body with powder coated finishes is low maintenance and very attractive. Both are excellent choices. In this post recession period before which many properties may not have been properly updated with a recycling program, many building owners are now fitting out buildings with improved equipment such as recycling receptacles. Recycling receptacles manufacturer Glaro Inc. provides the following tips to receptacle dealers, building managers, designers, architects and consumers seeking to research and purchase the right recycling receptacles for public and private facilities. First and foremost, identify your recycling needs and determine what functions are essential in any recycling receptacles that you purchase. What recyclables are generated the most at your facility? Paper? Waste? Bottles? Cans? A combination of recyclables? The type of recyclables will dictate the types of holes and openings you need on each receptacle. Next, identify what message the receptacles themselves need to convey. Most recycling receptacles come standard with a universal recycling symbol plus a message specifying the type of recyclable the can is designed to collect. However, many companies and organizations prefer to also include a custom silk screened logo for branding purposes. Glaro Inc. advises that all messages are permanently silk screened onto receptacles rather than added via stick-on decals, which can curl up and eventually fall off. Next, Glaro Inc. advises that you decide whether you would like connected recycling units (known as recycling stations) or if stand alone recycling receptacles are sufficient. According to the company, connected recycling stations keep receptacles more tidy and presentable, whereas stand alone units can be moved quickly and placed as individual units in any location. What size diameter recycling containers (or combination thereof) are needed for the designated location? Receptacles manufacturer Glaro Inc., for example, offers a versatile selection of 12 inch, 15 inch and 20 inch diameters, with 12, 26 and 33 gallon capacities, respectively. Glaro recycling receptacles of varying sizes may be connected to form an attractive professional Recycling Station! Because every building has “hot spots” where recycling receptacles are most in demand, the capacity and quantity you require will largely be determined by expected traffic levels. Plan accordingly. For more information on recycling receptacles, visit glaro(dot)com or the glaro blog here. Glaro Inc. (glaro.com) is a leading USA manufacturer of commercial and consumer aluminum and steel products sold directly to distributors/dealers for almost 70 years. All products ship in 1 to 3 days. Glaro Inc. products are the result of a focus on thoughtful innovation and design. Product lines include bellman carts, platform trucks, waste receptacles, recycling receptacles, smokers’ posts and receptacles, crowd control posts and systems, safety barriers, signs, sign frames, directories, menu display stands, coat hanging equipment, umbrella stands, wet umbrella bag holders, planters, and key drop boxes. A diverse selection of models in 31 finishes is produced in the Hauppauge, New York plant by skilled Glaro Inc. craftsmen. The company is known for its quality merchandise and its ability to consistently quick ship all products. The customer service department provides unusually prompt personal service and is sensitive to the needs of dealers and distributors.